Tourism experts have proposed that the government continue offering unilateral tourist visa exemptions for travellers from major markets to attract more visitors and generate revenue. Vietnam has been implementing a pilot visa exemption programme for tourists from Japan, the Republic of Korea, Russia, Sweden, Norway, Denmark and Finland for eight years. While the government is considering the programme’s effectiveness, some economists proposed a halt, stating that no visa fees have been collected from these tourists for the State budget. A tourist visa to Vietnam currently costs US$45 and if the exemption programme continues, the State coffers will lose about US$50 million. At a recent conference in Hanoi, the Vietnam Tourism Association (VTA) Vice President Vu The Binh argued that the loss of visa fees are just a drop in the ocean compared to the huge amount of revenue the tourism sector brings in every year. 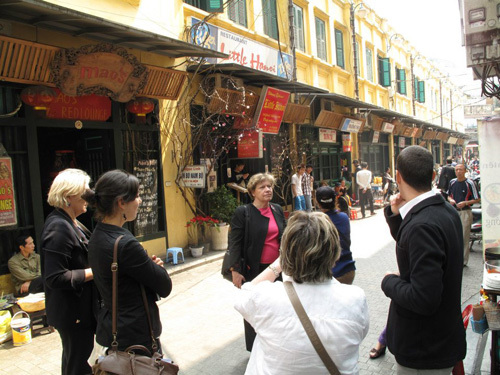 Last year, Vietnam attracted approximately 1.5 million visitors from Japan, the RoK and Russia. If each visitor spent an average of US$1,500 during their stay, the tourism sector would earn US$2.1 billion and contribute US$210 million in VAT to the State budget. While Vietnam may lose several tens of millions of US dollars from visa exemptions each year, it will gain billions of US dollars from the increasing numbers of foreign tourists visiting the country. “We should not miss out on US$210 million in VAT only to get US$50 million from visa fees, not to mention the other benefits these markets can bring to the country like employment, for example” Binh said. “In addition, visitors from these markets offer high pay for services which suit the national tourism development strategy until 2020 and beyond,” he said. At the conference, representatives of travel agents said service for customers from every market should be also taken into account as visa procedures are still cumbersome and time consuming. “Tourists must travel to the embassy to register and wait for a long time to get a visa….. If visa fees reinstated, Russian tourists will choose other destinations instead of Vietnam,” said Luu Duc Ke, Director of Hanoutourist. According to travel operators, only tourists who enjoy discovering a country’s natural and cultural attraction will wait for visas to be issued. Other tourists consider quick visa clearance procedures, safety and high quality services as most important. Those from Russia and Northern European countries belong to the second group. “If Vietnam wants to develop marine tourism, it needs to further simplify its policies to support foreign travellers,” said Nguyen Xuan Quynh, managing director of Vietnam Now Travel. Tour operators calculated that if the government stops the pilot programme, the number of foreign visitors to Vietnam will drop by 50%. They said the time involved to get a visa is a big obstacle to visitors. It is worth mentioning that visitors from Japan, the RoK and Russia account for a quarter of all foreign arrivals in Vietnam and one third of the country’s total tourism revenue. Pham Tu, former General Director of the Vietnam National Administration of Tourism (VNAT), recalled that after visas were first waived for tourists from Japan in 2005, the policy proved successful and it was replicated for visitors from other key markets. In Southeast Asia, Malaysia offers visa exemptions for tourists from 155 countries and territories, while Thailand applies a similar policy for tourists from 55 foreign markets. Indonesia also grants visas on arrival at its border gates to tourists from 24 countries. Incumbent VNAT General Director Nguyen Van Tuan declared that the Ministry of Culture, Sports and Tourism will propose that the government continue the visa exemption programme. I'm planing to take a cruise from HongKong to Vietnam on 15 of yanuary 2014, we'll stay there for one day I'm from Colombia - Southamerica. and my husband is from New Zealand do we required visas? Can you please advise re :visa for less than 24 hour stay in Ho Chi Minh city. Planning to take a cruise June 2015. . I'm a citizen of Trinidad and Tobago.. Thank you.